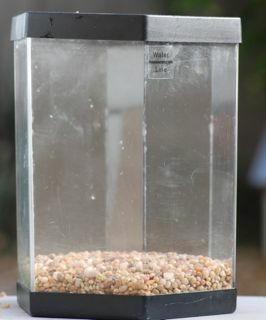 Building and maintaining a terrarium or an “ecosystem under glass” can be a fun science project. I. Choose the habitat you would like to study. Do you want a natural terrarium? 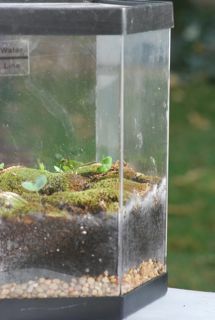 A traditional deciduous hardwood forest terrarium might include mosses, ferns and woodland plants. Other terrarium ideas are tropical rain forest, desert or boggy/swampy with carnivorous plants. Research the soil types, plant species you will need, amount of water to provide and what type of sunlight the plants will need. For example, a terrarium that represents the rain forest floor will need a lot less sunlight than one that represents the upper canopy. Younger children may enjoy a less complicated project, such as simply a few dandelions and some grass from the yard. b. Tops are optional, but helpful. You will need plastic wrap if you don’t have a top. 1. Layer the pebbles in the bottom of the container, roughly one inch deep. This is a garage sale aquarium. 2. Add soil until the container is roughly one third full. Create dips, mounds and valleys to add visual interest. 3. Decide on which side of the container will be the front. Plant the taller plants towards the back, smaller, low growing plants towards the front. 4. Water thoroughly, taking into consideration the type of habitat you have prepared. 5. Cover the terrarium. Use plastic wrap and a string or large rubber band to hold it on if you don’t have a cover. Watch as condensation forms on the sides of the container during certain times of the day. You can even see droplets form on the top and “rain” down. 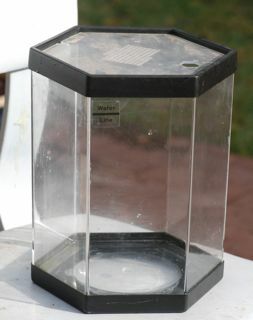 A terrarium can be used to study the water cycle. Once your plants are established, you may consider adding soil creatures. The soil creatures can add an element of interest, but also require more care. Also keep in mind that many soil creatures are active at night. If you try earthworms, make sure you have the right kind of earthworm. The red wigglers used in worm bins live in leaf litter at the surface of the soil in nature. They do better in bin than a terrarium unless you provide leaves for them. 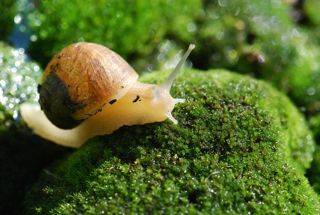 Slugs and snails eat plants. They will both require extra food, such as vegetable scraps, and snails need a calcium source like a clean eggshell. Rolypolies or sow bugs do well in a terrarium, but also need added food. Carrots are good for rolypolies. If you add creatures, be sure to keep the terrarium clean. Vegetables can harbor small mites and/or springtails as well as become moldy. A well-maintained terrarium may be an interesting science project. Study how fast the plants grow and which types survive best under the conditions provided. If you can keep the mosses happy, you will be able to see the different reproductive structures such as the sporangium and gametophyte. Mosses are non-vascular plants so they must absorb water directly from the soil. They do not have true roots or leaves. Spend time observing different types of mosses and learning about them. Carnivorous plants require very special care but are also fascinating. 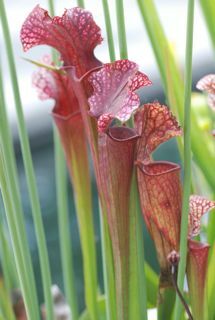 These are pitcher plants. Insects fall into the "pitcher" and can't crawl out again. Hope you give a terrarium a try.